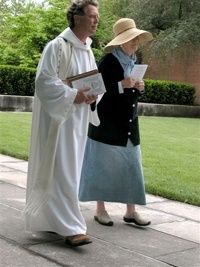 The Reverend Dr. J. Philip Newell, an internationally acclaimed scholar, lecturer and writer, officiated at the rededication of the Roofless Church in New Harmony, Indiana, on May 1, 2010. Attendees celebrated the church’s 50th anniversary at the interfaith service. Former Warden of the Iona Abbey in the Western Isles of Scotland, Dr. Newell is currently Companion Theologian for the American Spirituality Centre of Casa del Sol in the high desert of New Mexico. He is widely acclaimed for his work in the field of Celtic spirituality, including his best known titles Listening for the Heartbeat of God and Christ of the Celts, as well as his poetic book of prayer Sounds of the Eternal. Among other titles authored by Newell are the following: One Foot in Eden: A Celtic Look at the Stages of Life, Celtic Benedictions, and Celtic Prayers from Iona. A Church of Scotland minister, Newell is known to have a passion for peace in the world and a fresh vision for harmony between the great spiritual traditions of humanity. Canadian by birth, he lives in Edinburgh with his family where he undertook his doctoral research in Celtic Christianity. Since then he has played a leading role on both sides of the Atlantic in the re-birthing of a creation spirituality for today. With a widely dispersed ecumenical following, Newell possesses extensive experience in leading retreats and has been a scholarly voice in recovering the Celtic tradition on both sides of the Atlantic. The Roofless Church commemorates New Harmony’s religious heritage. Dedicated on May 1, 1960, by Reverend Pitney Van Dusen, president of Union Theological Seminary, the interfaith church is an award winning design by architect Philip Johnson. Entered through massive bronze gates, the open-air sanctuary upholds the belief that only one roof, the sky, could embrace all worshipping humanity. A 50-foot dome covers the altar and is shaped as an inverted rosebud in honor of the Harmonists trademark, the golden rose. The church also features “The Descent of the Holy Spirit,” a sculpture created by Lithuanian-French sculptor, Jacques Lipchitz and “The Pieta” by noted American sculptor, Stephen DeStaebler. The Roofless Church is owned and managed by the Robert Lee Blaffer Foundation, a foundation that was founded by Jane Blaffer Owen in memory of her father. Jane Owen sponsored the rededication service, along with the Foundation’s Trustees. Mrs. Owen passed away on June 21, 2010. She is deeply missed by those who knew and loved her.